Every owner of pet chinchillas wants them to be tame enough to pick up and hold. We're no exception. However, chinchillas in the wild are prey for many predators and are conditioned to be cautious. But all is not lost. With a little time and patience, you can tame your chinchilla enough so that it doesn't run and hide when you approach. The trick is to reward good behavior with a treat such as a raisin. At the beginning, good behavior is something as simple as coming up to you when you sit still near them. Over time as your chinchillas become comfortable with your presence, you reward them for crawling on your hand or leg. Eventually they'll get used to this activity too. You may wish to someday move beyond taming your chinchilla and enter the realm of actual training. Like taming them, training starts off with simple tasks each of which are rewarded. For example, we've trained our chinchillas to return to their cage at a certain time every night where they'll receive a treat. This is very helpful to us since it keeps us from having to chase them and it also means that we don't unnecessarily stress our chinchillas from such chasing. We've read about others that have managed to train their chinchillas to jump and roll on demand, but we've yet to see proof of such successes. My chinchilla is been with me for two months, and i have tried to train her to get back in the cage by herself and give her a treat, although it doesn´t work at all. she never wants to get back in he cage so i have to wait for her to get in to drink or eat so i am able then to lock her, but i feel a bit bad when this happens and she gets quite upset... is it still soon for her to learn to go the cage and then get the treat, or is it just a naughty chinnie? Our new chin (husband and I) is 6 month old and has 2 personalities.. from about 9pm he's super energetic, scraping at the door of his cage to come out and run around, climbs all over us, gives me a "kiss", responds to our calls, and let's us stroke and pet him as he explores. From morning until 9pm he is the polar opposite. He hides in his box and won't approach the door, flinches at the sight or sound of us, clicks and bites (his own fur even) when our hands come near him, won't respond to treats or any interaction such as soft speaking or singing. I'm just confused as during the day he behaves as people say a new chin will behave until we gain his trust.. but then at night he behaves as if he actually really likes us! Can anyone help or offer an explanation? Chins are nocturnal. If you try to do things with it during the day while it's supposed to be sleeping, it's like someone waking you up in the middle of the night to play. It may be irritable at a disruption in its sleep cycle. They sleep during the day, as in alllll day.....they don't want interaction in the day, at all, sometimes they sleep with their eyes open as well, Leave them alone during the day, let them come to the cage door to be let out when they are ready in the late afternoon or evening. They do wake here and there, to move, or itch, or have a drink or food, but they then go back to sleep. Would you want someone talking and singing and proding at you whilst you try to sleep? This is why. Hope that helps. I can't see the date that your post was published, but the same thing happened to me. The best thing to do is to leave a trail of treats. And to just watch from a distance, once they come out far enough, block the hole and then try and catch them. Do this at night from about 6pm as they are nocturnal. My chins are much more friendly during the night especially around 9-12pm. I have noticed that too!! when i take her out around six or seven she doesnt exercise much, and she misbehaves a lot, although from 10pm onwards.. she is adorable! I will try the trail of treats to get her back in..
Chins can go up to 3 days with out food and water. I have to chins that when they escape they play for like two days. Yesterday was cage cleaning day chewy who regularly likes to play hide and seek is out now. I kept a small cage open with foods hay and water. The food is gone so I know he eat. Chewy and Angel both boys. Alfa boys like to explore for two days then they get so tired they let me catch them. As soon as you get her out. More likely at night. Block that whole. She can be chewing and making the whole bigger. I know it sounds mean but some time we have to crab them by the tail to get them out of a sticky situation. It will not hurt them. Sgueezzing there bodies can hurt them. I have 9 chinchillas. Chewy And Angel are less then 6 months. They are like toddlers. They like to play and get into things. As they get older you will have more control over them. It's also best to have two. They are very social and can get lonely and board. Plus they are playing all night. Also being you just got her (right now you need to keep the cage open and bring it in the kitchen she may have lost her way). Right now is not a good Idia for you to leave the cage open once u catch her. It's best to take her in the bathroom let her exercise there. Putting everything away. I also now give them thier dust baths in the bathtub as well. It helps with keeping the cages clean. Also shut the lid to the toilet. She will come out. It has been said the first three weeks you want to stick your hand in the cage for her to bond. She is probably lost. Again bring the cage into the kitchen. Enjoy your baby. Yes continue to be gentle with her and speek kindly to her and when she does come out say good girl. Chins are very sensitive and wil respond Badly to yelling hitting. They only respond to kindness. I hope she is in her cage now! I have two Chinchilla's. The first one will be 11 months old in a few days. I have had him since he was 2.5 months old. He loves to be pet held and play. I have trained him to come to his cage door whenever someone opens it. You can stick your hand in his cage and not worry about him biting you. The other day I got another chinchilla that is 5 years old. (Both are males). The 5 year old was neglected. He was only taken out of his cage and held twice. He doesn't like being touched or taken out of his cage. He bites and growls. When I do get him out and I hold him and pet him he is ok but starts getting a little cranky and wants to go back in his cage. How do I break him from this habit. I want to be able to take him out of his cage no problem and stick my hand in without getting bit. How can I help him become more comfortable and about how long will this take? Also when can I introduce the chins to each other so I can eventually put them in the same cage. Thank you! I own 3 male chinchillas. 2 of them I got from people that own a lot of them & the other was owned by someone that's never had one before & they never took him out of the cage & when I first got him was like the way you're saying yours is. I've only had him maximum of 5 months & he's the most social chin I have. All you have to do is give lots of treats. I put mine all together right away & they love each other. I would try putting them together while watching them. If they hump each other it means they are getting along its a normal thing. Hope this helps. Young enough to tame it? Yes it's young enough. I've got one a few years of age & I have tamed him. This is precious! How did you train him?? My daughter purchased two female Chins a couple of months ago.One is quite 'placid' but she says the other one runs around like a lunatic..bouncing off walls and furniture...it hid behind the washing machine for four days and wouldnt come out..she had to leave food and water..which went overnight.She has now managed to coax her out but she says some of the fur is coming out..(maybe stressed?). My daughter is out at work all day..but the Chins have a large cage and a play area..they get all the recommended food etc and the house temperature is OK.
Fur loss is normal. They do shed, but when it comes out in clumps its because they are stressed. It's not a huge deal to worry about but you don't want it happening all the time. i bought a male and female from a woman who seemed to be tired of them both.I spoil them at Petsmart alot.They kiss me on the mouth when i say smooch ,jump on my leg,and let me rub them them while they are feeding but when they are in cage or running around they let me touch them minimum and even make noises like they dont like it. I let them run around the room hours at a time. Is it better to purchase a baby chinchilla or an adult? @Kiki- you should probably get a baby-1.will give you more time to bond 2.adults might have had bad experiances in the past. I have found that you can pick up a chinny by the BASE of their tail if you can get that close when playing ring around the rosy. Trick is to sit still and let them come to you then quickly get the tail. The response is similar to that of a Mom cat picking up a kitten at the scruff of the neck. Don't make this the way you pick your chinny up all the time! Please do your research before owning a chin! NEVER pick up a chinchilla by the tail. When my daughter got her chinchilla she was told to grab the chinchilla by the base of the tail but this would turn out to be very bad advise when half the chinchillas tail broke off because it tried to run away. Grabbing any animal by the tail is surely an uncomfortable feeling. P.S the chinchilla is fine, shes got half a tail but happy and healthy. I've always been afraid to pick up my chinchillas by the tail. I've heard that if you do it's possible to break off the tail and cause bleeding. I suggest that people with no chinchilla experience try to figure another way to handle their chinchilla. my chinchilla is fine, he plays in his cage no bother but he gets in hyper moods and doesnt let my cuddle hima nd whenever i let him out of his cage he sprints around the gaff like hussain bolt?? Any ideas?? Chinchillas are naturally moody. Some days mine will come to me and want to play. Other days they will hide from me and not come out of hiding. Sometimes they will want you to pet them, and other times they don't. I would consider your chinchilla as beinghappy when he goes running around the room like a bat out of hell! Mine chinchillas run and bounce off the walls. This means they are happy. When I got my first chinchilla he would just sit there and act like he was in a trance. I felt like it he was very unhappy. So I chinchilla-proofed a room and allowed him and the other chinchillas to run free. They seem very happy that they have their freedom to play and exercise any time. He is probably so excited to be out of the cage, that he will run and then freeze, then run again. Be careful how much cardboard your chinchilla chews, they need to be monitored on how much they are eating. You don't want your chinchilla to get an obstruction in his intestines. i've heard that chinchillas don't digest sugar pretty well, so my question is: are raisins a safe treat? i'v been using this rose things but i want to use more kind of treats to make my chinchilla a little bit more tame. she already climbs on to my lap or my leg when she's running free, but doesn't let me touch her then. You should only treat a chinchilla to 1 raisin a week if you want it to live anywhere near its expected lifespan. Although it may seem boring that its only eating pellets its important for it to have a very stable diet. You can buy dried banana chips for them. My chinchillas love them. Just don't give them too many. They do have some sugar in them. Actually, raisins and banana chips are not good for chinchillas. They can have rosehips and an occasional plain cheerio. when he runs away chuck a big towel over him instead of chasing him. the dark will calm him. give him a rasien every time you pick him up to say "if you come to me its a good thing and you will get a reward"
I got a new baby chinchilla and I chase him to pick him up but when he's in my arms he gets calm, but when I let him go, he runs away again, so what should I do about this? That is the nature of a chinchilla. They will run from you even after they get to know you. Try not to chase yours as this will scare him. Try other methods such as offering a treat to get him to come to you, or get his dust bath and put it near him. Most chinchillas love their dust baths. And if you really can't get him to come to you, try lying down on the floor. Be patient. Most chinchillas love to climb up and down on your body. This means they trust you and love you. my chinchilla will let me pick her up but she still runs away when i put my hand in her cage. and i half to let her calm down to catch her. and about the only way i can catch her is to scruff her wich i know doesent hurt her but i would rather her come in to my hands how do i get her to do this? ya know my biggest quiestion STILL hasnt been answered!!!!! It is...Do chinchillas have nails and if so what would you do with them!!!???????? Do we have to cut them or what!!?? No they don't have any nails. They're like kangaroo rats in that they have small front hands and long back feet for hopping. ummm... hi i have a chinchilla and his name is ollie and i wanna know how to train him to tame.He's not the skiddish chinchilla ever but he gets scared and starts squeeking whenever i go to let him out of his cage. What do these squeeks mean and how do i get him tame enough to where he wants me to hold him? bond with ollie. I bond with mine. I read to it, listen to music, dance, it likes to play games in his chewed up doll house, take him to the bathroom with you and let him run. Just be sure you are also strict on boudaries, such as wires and places he might go under that you can't get him out. I should tell you this one funny story that happened when I first got mine. Well my first chinchilla used to open the door to the bathroom and the second chinchilla I have now... well he jumped in the toilet. It was kinda funny, poor thing. But he learned his lesson. Anyway just bond with him and he'll warm up to you. I just got a chinchilla and I would like to let her run around the house but everytime I let her run around she's always pooping can I train her to go in her cage and poop???? well you could train them to poop in their cage, but it's not likely they will learn. there are certain times of the day they go to the bathroom. Usually during the time around 11am to about 4-5pm is when they don't normally poop. I know you can pee train them. That's what is more important to worry about. The poop is safe. I take my chinchilla out a lot and he does all over. I clean up after him every once in a while, but it's not that bad of a health hazard to you. Now if it were a bunny or a rat? Those are health hazards. For all of the people who ask how to get them used to you, all you have to do is set in a small enclosure with him/her and she will climb on you eventually. The first time this happens give them a raisin (only one per day as they can get sick, I suggest the chinchilla yogurt drops, they can have two a day). This will cause her to want to climb on you because chinchillas eat a lot. If she nibbles on you, dont jerk away, because you might scare her. If you scare a chinchilla they will hold a grudge as dumb as that sounds. I know for a fact that this works because I successfully made two sisters used to me as well as a seperate chinchilla that wasnt even mine. After about a week or two they will begin climbing on you more, and eventually they will sit in your hands but dont force them to. Try not to scare them because if you have one bad encounter, then all of your progress will be for nothing and chances are you will have to start over, but if they like you enough they will run to you when they are scared. Be patient. Ive had my Chinchilla for about 6 months now and he is really tame. Ive not done anything special apart from just give him plenty of attention and he gets a treat when he comes to me. When i originally bought him he was with his brother who died a couple of weeks after i bought them. This encouraged me to pay even more attention to my chinchilla (called Boris) as he was obviously looking lost without his brother. Now Boris sqeaks and beeps at me and always tries to jump on me. Just let the Chinchilla get use to YOU, not the other way round. After a few months they'll be excited to see you and probably bouce everywhere like mine does. I got Clover when I was 13, so I was old enough to take care of her and love her, but didn't quite understand why she wasn't the perfect lovable pet I expected. I used to chase her to get her back in her cage and hold her when she obviously didn't want to be held. Now I'm 20 and I wish she were happier and loved me as much as I love her. She likes her exercise time and will sometimes come over and hop on me, and she likes being scratched and pet in her cage, but I wish when I went to pet her or hold her while she's running around, she would let me. It makes me really sad. How do I get her to like me, even after all these years of not having a strong relationship? Hopping on you and letting you scratch/pet her in her cage means she DOES love you. Chinchillas normally don't like to be held or touched much when they have playtime and are running around. It's a normal chinchilla thing. i taught my chinchilla how to stay anf another how to follow me and one other how too excape from a leash and collor. but i have a? is it ok to bring chinchillas on a walk if your holding it??? I take mine for walks all the time. I carry him of course but sometimes when I am wearing a pullover he will either sit in my hoodie or in my hand warmer in front like a kangaroo. its cute. a chinchilla generally does not like to be touched, but some chinchillas, after becoming attached to their owners( whitch usually only happens if it rarely sees anyone other than the owner) will allow , and in fact, enjoy, having their throats rubbed and in some cases( like my chin, an ebony called guinness) actually like to be held and petted on their back. it is possible to train your chinchilla to play simple games with you, such as "tug of war" (guinness loves doing this with the drawstrings to my windowblinds). there really is no set way to train your pet, once it(and this may never happen at all, through no fault of the owner) becomes accustemed to you. my chinchilla has no set scheduale for feeding( he always has a full bowl) and i let him out at least twice a day, sometimes as long as 6 hours. as i am always in the room when he is let out of his cage, he has become somewhat attached to me and will come when i call his name, follow me around the room, and jump all over me to get my attention so ill play with him. he will try to climb my pant legs sometimes, until i put him on my shoulder and occasionally even grooms me. im really not sure why he does this, i did nothing to train him, i just sorta treated him like you would a spoiled cat. if anyone can explain his odd( if lovable) BEHAVIOR TO ME, ID BE GRATEFUL. I got my chinchilla when she was 6 months old, now she is 15 months old. What should I reward her with for doing a good thing? Give her a willow stick or an apple stick. These are healthy treats that can be given multiple times daily. Once a week, she can have a dried rosehip or a plain cheerio. I have trained 1 of my chinchillas to give me a kiss before he goes home he also gives high fives, nock on doors, and sometimes when he's in a good mood i can tell him stand and he will get up on his hind legs. But I have only been able to do that with one of my chinchilla the other two just don't know how and i can't get them to. Monica, you can't house train a chinchilla. They will only urinate on the bedding (I don't know the reason of that, but they just do that by their own, with no training), but they will always poop everywhere they go. I heard an oppinion, that maybe they don't even realize they're dropping a poop. I've been reading your site here, and I saw that you guys have said that you trained your chinchillas to go back into their cages. Could you please give me some pointers on how to do his? My chinchilla is about 9 months old and I have had him since he was 2 months old. My question is how to house train him. I am having lots of trouble with this, the reason I want him house trained is due to he poops everywhere. He only tinkels on me or on the furniture or in his cage, and I want to let him loose I just dont want him using the bathroom everywhere he goes. Any ideas would be great. We've had our chinchilla for about 9 months now and in the last month she has started biting us when we let her out at night. It started with attacking a furry slipper I had then our feet and now as soon as we let her out all she does is try to bite feet, hands whatever. PLEASE HELP! My husband is wanting to get rid of her because of this. We have a three year old chinchilla we got at about one year old. He was terrified at first and it took quite a while to get him to trust us (much time and patience). He was well worth it however and is a great pet. He does know his name and comes when called while in his cage (even midday from a deep sleep in his little wooden "sleep house" he will run out to greet us when called.) We have one other way to call him and that is by running our nails up the bars of the cage. He instantly appears! Sometimes for a raisin and sometimes for a scratch, (he loves to have his throat scratched) or just for a kiss (yes he kisses)!!! I think the key is trust and patience and reasonable expectations. I've never heard of one doing tricks. We never "make" him do anything; only what he feels like at that time. He is also very vocal and "tells" us if he is upset by something and we listen! We are well trained!!! PS ....you can buy a "cold stone" at the pet store for your chin, keep it in the fridge and offer it on hot days (best to buy 2 to rotate out) your chinchilla will die from heat stroke or end up seriously and permanently disabled. i have "trained" my chinchilla to come to me when im shaking her treat box which was fairly easy but she still doesnt trust me - she takes the treat and runs- any ideas to help me earn her trust?? Has anyone had any success in getting a chinchilla to walk on a ferret harness? Generally speaking chinchillas can't be trained. They will run around and chew on anything they find. We've tried a spray that supposedly tasted bad, but it did nothing to stop the chewing. The only solution we've found is to chinchilla-proof a room. To get your chinchilla to go in to its cage make the cage the safest place in the room. Do this by NEVER grabbing your chinchilla from the cage. That way when scared he will run in to the cage knowing that you won't follow. We're at the point where we can sometimes clap our hands at night and have our chinchillas run in to their cage and await their nightly treat (a raisin). Hey Chinchilla planet i have a 5 month old chinchilla and he has his own room to run but i have to run every where just to put him in his cage and he bites me all the time. i want to train him to go in his cage but i also want him to stop eating the wooden furniture and to go to the bath room in his cage to. i dont know what to do. I "trained" my chinchilla to wink at me when I wink at it. And since I give him a treat afterwards, sometimes he winks when he wants one. That's about it. He also knows the sound of the treat box/bag so that can be used as a training tool. It's best if you assume that your chinchilla will be untrainable. I've yet to see one that can roll over on demand. If you have success with that, send me a movie as I'd love to see it. The closest you're likely to get to them standing up is holding a treat e.g. a raisin above their heads. 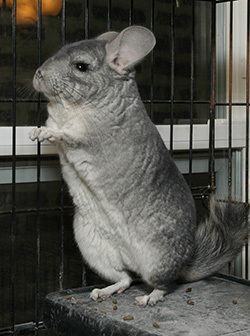 I am getting a chinchilla and I am wondering how long will it be until you train them to do something? Like training them to do something different like standing up or rolling over. You're going to have to start from scratch and earn your chinchillas' trust. One way to do this is to sit still in the same room that you allow them to run around in. If they approach you, do not attempt to pet them. Let them sniff you and eventually they'll crawl on you. Only then should you attempt to touch them using very slow movements. This process can take many days or weeks so please be patient. Also, never chase your chinchillas once they are in their cage. This way they will learn that their cage is safe and will run in there on their own instead of under the bed when frightened. At first you will probably need to "encourage" them to return to their cage after play time. If you end play time at the same time every night, they will learn to go in to their cage on their own. I have a 10 month old male (Fred) and a female I just bought (Kiwi). The problem is I've never picked Fred up from underneath but instead always from the top so I don't think I'll be able to pick him up. Also, when I get him out he runs straight under the bed. So what should I do with my problems? Also how did you train yours to go back in to the cage? Most chinchillas can't be trained. They don't respond to names or "requests". Ours know when to run in to their cage at the end of their play time, but that's about it. As for holding them, they will hopefully get used to you eventually. You might want to try rewarding them with a raisin while you hold them so that they'll associate the treat with your handling of them. Don't go overboard with the raisins though. Consider breaking a single one in to small pieces so you can feed them multiple times. Aluminum foil is so thin that it'll warm up fairly quickly after being taken out of the freezer. The benefit to your chinchillas will be negligible. Check out the article on emergency cooling for some tips. Do you guys have any tips on how to train chinchillas? Mine don't bite or fight, but they don't come to you or stay still when you hold them. P.S. Also, if I freeze aluminum foil, and tape it to the side of a cage, will it help stop heat stroke?